Why Circle Magnets 2.12 Inch May Work For Your Campaign? Circular magnets 2.12 inch offers you true value for the investment because they are lasting, affordable and adorable than any other small value promotional item. You can use circle magnets for promoting your advertisements with minimum efforts. A perfect circle is a big surprise in itself. It is said that circle is the only shape, which completes 360 degree of completion. All our senses are related to this 360 degree of perfection. No wonder you can create marketing wonders by working over this circle surface. Perfect for announcing specials in your shop, discounts or any other marketing events or plainly you can use this circle magnet for highlighting your brand logo. All these years you mostly tried to keep your advertisements in black and white because you feared that colors may cost you bombs and rip you off your savings. Now you can stay committed to your original brand color or test with a riot of colors without fear because free full color printing is the basic feature of magnet advertising. Allow You to Save, Save, Save, and Save Ever! 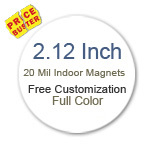 By investing in circular magnets 2.12 inch, you are not only attempting to wow and impress your customers, but also saving on efforts, branding, shipping and many other features. Most of e-commerce stores, which you may consider for purchasing customized magnets, allow you to save, save, and save throughout the way. Free art setup, free online design proof, and free full color printing are some benefits that you can expect on purchasing these promotional magnets from any reputed online e-commerce store. Personalized circle magnets 2.12 allow you to last longer than most of your counterparts who have already invested in small and cheaper promotional items. You can easily feature over their consciousness because these small promotional magnets possess strong magnetic backing. They will remain fixed over refrigerator doors or car doors unless and until someone removes them forcibly. Don’t these factors give you confidence that your campaign is going to inch towards success by featuring over these small, yet overpowering promotional magnets? If your answer is still a NO perhaps, you are reluctant to try magnet advertising.